Re: Z900 Bread Box dissected. Because I really like the exhaust exit on mine (no slip-on, tip on bread-box), I've been toying with the idea to cut open the bread-box to allow me to make a cut in the internal tube - eliminating the 2-chamber design that it is. Again, if you keep the bread-box and want it louder, either eliminate the CAT or make internal mods to the bread-box. But just drilling holes will make it sound cheap/bad IMO. 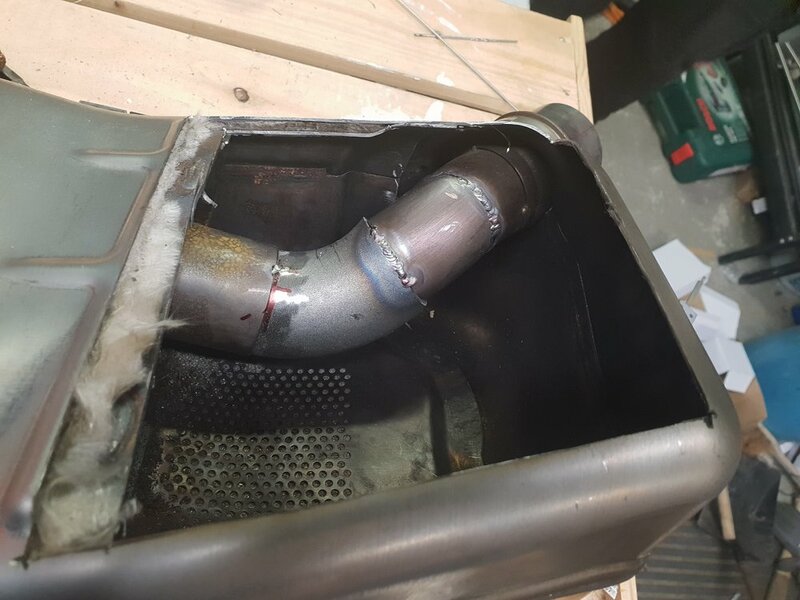 If you don't mind pulling the whole exhaust off the bike, cutting the breadbox and welding it can be done successfully. Just cut a three sided square hole and bend the metal back so it'll go right back in place. The problem with monkeying around with the exhaust is the velocity needs to be maintained for proper low RPM scavenging. Pipe length is important. That is why I'm adding the dan moto can on rather than just an exhaust tip. 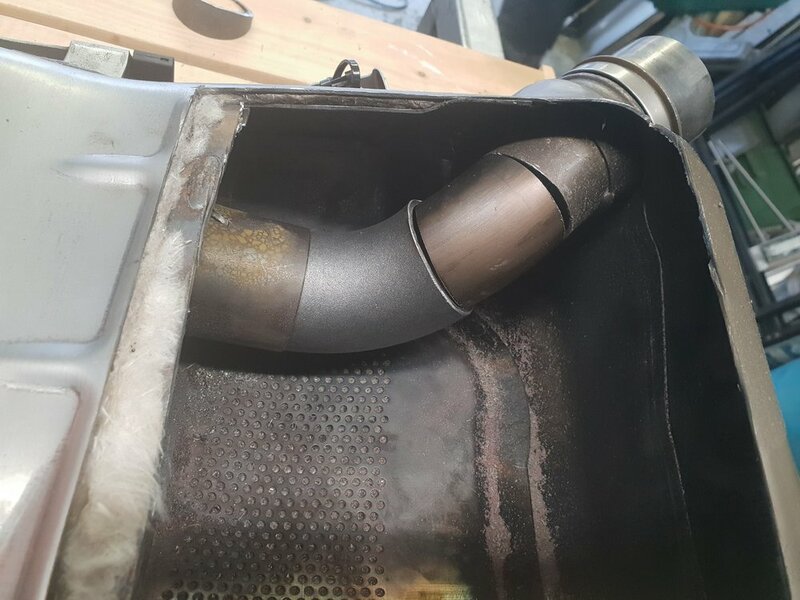 I'm going off the theory that Kawasaki put some thought of the exhaust flow when they designed the pre muffler, though sound reduction is probably higher on the list. Nope...Euro 4 is the only reason for the way the exhaust is engineered (post CAT). These are not 2-strokes where scavenging is a science (chamber, convergence cone, stinger, ect). Tube diameter and how the four tubes join is where you make power (marginal on 4-strokes). Once the exhaust fumes/gasses reaches the collector area, it pretty much only comes down to sound attenuation. Looking at the construction of the breadbox, keeping in mind I'm no engineer, things look to get pretty turbulent in there. True it's not a 2 stroke but there still needs to be a certain flow for proper scavenging or else why would changing from the OEM can to a loud straight through design, on older systems, decrease bottom to mid range torque? However, we have the breadbox so anything after that is probably moot and restrictive. why would changing from the OEM can to a loud straight through design, on older systems, decrease bottom to mid range torque? On "older systems?".... Anytime you free up a motor, its important to re-adjust the tuning for the exact situation. Also, going to a larger primary tubes with a 4-1 could cause a slight dip at lower RPM. It's not a matter of as open as possible, its about choosing the right parts to make for a true "tuned" package. Ignore that and get less than ideal results. Yep, that is correct. I'm not going to tune my bike just for the End can seeing how there's a breadbox as well. Between the baffling in the pre-muffler and more baffling in the OEM end can I'm surprised the exhaust can figure a way out . What surprises me is that companies offering full systems are telling buyers that no tuning is needed on our bikes. I just don't believe them. Especially if a low restriction air filter is used as well (though I don't know their advice when used with a performance air filter). 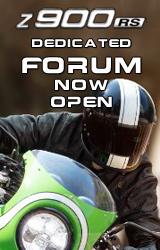 It's been discussed and dyno logs have been posted showing the Z900 is actually really rich bone stock. However, it is important to distinguish the difference of running lean/rich VS. properly tuned for max perf/efficiency. As I said, in the case of the Z900, you are not going to run dangerously lean if you only do a full exhaust - just won't be optimal. No point going half way with the full exhaust, especially if it's an expensive system. In for a dime, in for a dollar. Yeah I don't think modifying the breadbox would make the bike go worse, really it could only help exhaust flow really, might even go a bit better, maybe not. We will only know when someone out there does it as an experiment and tells us. And its true that this bike will never run lean no matter what exhaust you put on it, and the motor will not suffer at all. Unless you want to dupe your local authorities there is little point in modifying the bread box. Just cut it off and fabricate a link pipe from the cat or collector. 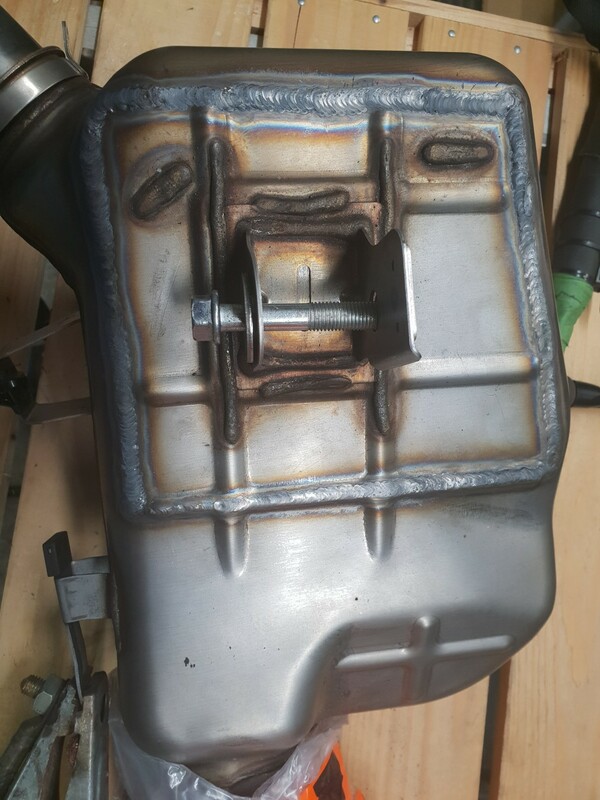 There is little point to a free flowing exhaust unless you free up the air moving into the engine. Adding also a low restriction air filter the bike will run lean.